CAIRO - Flames lit up downtown Cairo, where massive clashes raged Sunday, drawing Christians angry over a recent church attack, Muslims and Egyptian security forces. At least 24 people were killed and more than 200 injured in the worst sectarian violence since the uprising that ousted Hosni Mubarak in February. The rioting lasted late into the night, bringing out a deployment of more than 1,000 security forces and armored vehicles to defend the state television building along the Nile, where the trouble began. The military clamped a curfew on the area until 7 a.m. The clashes spread to nearby Tahrir Square, drawing thousands of people to the vast plaza that served as the epicenter of the protests that ousted Mubarak. On Sunday night, they battled each other with rocks and firebombs, some tearing up pavement for ammunition and others collecting stones in boxes. At one point, an armored security van sped into the crowd, striking a half-dozen protesters and throwing some into the air. Protesters retaliated by setting fire to military vehicles, a bus and private cars, sending flames rising into the night sky. After midnight, mobs roamed downtown streets, attacking cars they suspected had Christian passengers. In many areas, there was no visible police or army presence to confront or stop them. Christians, who make up about 10 percent of Egypt's 80 million people, blame the country's ruling military council for being too lenient on those behind a spate of anti-Christian attacks since Mubarak's ouster. As Egypt undergoes a chaotic power transition and security vacuum in the wake of the uprising, the Coptic Christian minority is particularly worried about the show of force by ultraconservative Islamists. Prime Minister Essam Sharaf, addressing the nation in a televised speech, said the violence threatened to throw Egypt's post-Mubarak transition off course. "These events have taken us back several steps," he said. "Instead of moving forward to build a modern state on democratic principles we are back to seeking stability and searching for hidden hands  domestic and foreign  that meddle with the country's security and safety." "I call on Egyptian people, Muslims and Christians, women and children, young men and elders to hold their unity," Sharaf said. The Christian protesters said their demonstration began as a peaceful attempt to sit in at the television building. But then, they said, they came under attack by thugs in plainclothes who rained stones down on them and fired pellets. "The protest was peaceful. We wanted to hold a sit-in, as usual," said Essam Khalili, a protester wearing a white shirt with a cross on it. "Thugs attacked us and a military vehicle jumped over a sidewalk and ran over at least 10 people. I saw them." Wael Roufail, another protester, corroborated the account. "I saw the vehicle running over the protesters. Then they opened fired at us," he said. Ahmed Yahia, a Muslim resident who lives near the TV building, said he saw the military vehicle plow into protesters. "I saw a man's head split into two halves and a second body flattened when the armored vehicle ran over it. When some Muslims saw the blood they joined the Christians against the army," he said. Television footage showed the military vehicle slamming into the crowd. Coptic protesters were shown attacking a soldier, while a priest tried to protect him. One soldier collapsed in tears as ambulances rushed to the scene to take away the injured. At least 24 people were killed in the clashes, Health Ministry official Hisham Sheiha said on state TV. State media reported that Egypt's interim Cabinet was holding an emergency session to discuss the situation. The protest began in the Shubra district of northern Cairo, then headed to the state television building along the Nile where men in plainclothes attacked about a thousand Christian protesters as they chanted denunciations of the military rulers. "The people want to topple the field marshal!" the protesters yelled, referring to the head of the ruling military council, Field Marshal Hussein Tantawi. Some Muslim protesters later joined in the chant. Later in the evening, a crowd of Muslims turned up to challenge the Christian crowds, shouting, "Speak up! An Islamic state until death!" Armed with sticks, the Muslim assailants chased the Christian protesters from the TV building, banging metal street signs to scare them off. It was not immediately clear who the attackers were. Gunshots rang out at the scene, where lines of riot police with shields tried to hold back hundreds of Christian protesters chanting, "This is our country!" Security forces eventually fired tear gas to disperse the protesters. 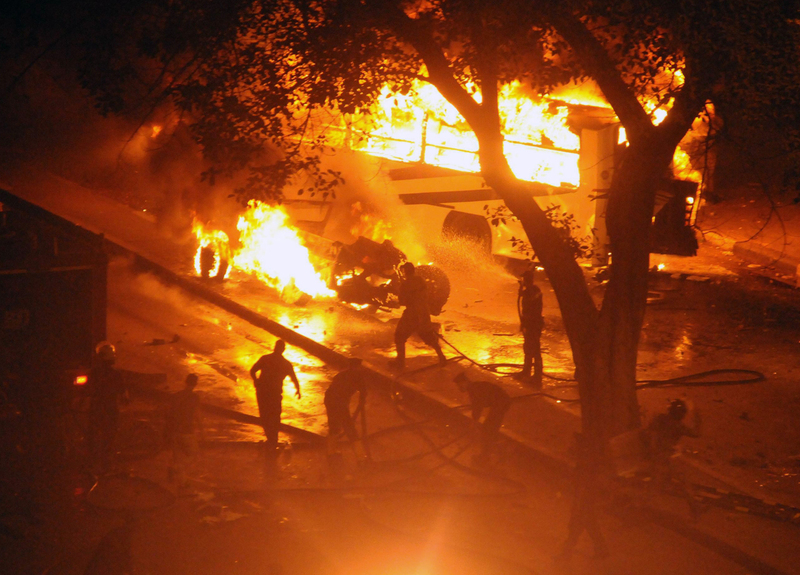 The clashes then moved to nearby Tahrir Square, the epicenter of the uprising against Mubarak. The army closed off streets around the area. The clashes left streets littered with shattered glass, stones, ash and soot from burned vehicles. Hundreds of curious onlookers gathered at one of the bridges over the Nile to watch the unrest. After hours of intense clashes, chants of "Muslims, Christians one hand, one hand!" rang out in a call for a truce. The stone-throwing died down briefly, but then began to rage again. In the past weeks, riots have broken out at two churches in southern Egypt, prompted by Muslim crowds angry over church construction. One riot broke out near the city of Aswan, even after church officials agreed to a demand by ultraconservative Muslims known as Salafis that a cross and bells be removed from the building. Aswan's governor, Gen. Mustafa Kamel al-Sayyed, further raised tensions by suggesting to the media that the church construction was illegal. Protesters said the Copts are demanding the ouster of the governor, reconstruction of the church, compensation for people whose houses were set on fire and prosecution of those behind the riots and attacks on the church. Last week, the military used force to disperse a similar protest in front of the state television building. Christians were angered by the treatment of the protesters and vowed to renew their demonstrations until their demands are met.